You can expect a wide variety of traditions represented in Philadelphia Trans Wellness Conference spirituality programming. While there are some recurring themes, every year is different depending on what volunteers are available and what they are working on. The very first Friday Night Shabbat Service was in 2009. After several years in the basement of Arch Street United Methodist Church, where Shelley Rosenberg began orchestrating a vegetarian and kosher dinner before the service, the event moved to the John C. Anderson apartments (251 S 13th St, Philadelphia, PA 19107) in 2015. Peterson Toscano's Transfigurations: Transgressing Gender in the Bible offered as an evening event. Yoga joins the array of spiritual opportunities. You can expect a trauma-informed, trans-affirming yoga opportunity at the end of day session on Thursday and in the morning on Friday and Saturday. Chief Bob Red Hawk brings greetings from the Lenape Nation for the first time. The spirituality track leadership encouraged Native American/First Nations programming for several years before a seperate (sovereign) People of Color - Native American/First Nations volunteer working group began to operate on its own in 2012. You can expect several workshops about and/or for Two Spirit people at the conference, though they may not be listed under spirituality. Fr. Shannon Kearns was ordained to the Diaconate of the Old Catholic Church at the 2012 conference. Watch for unique special events such as this in and around the conference, including speakers at local congregations. 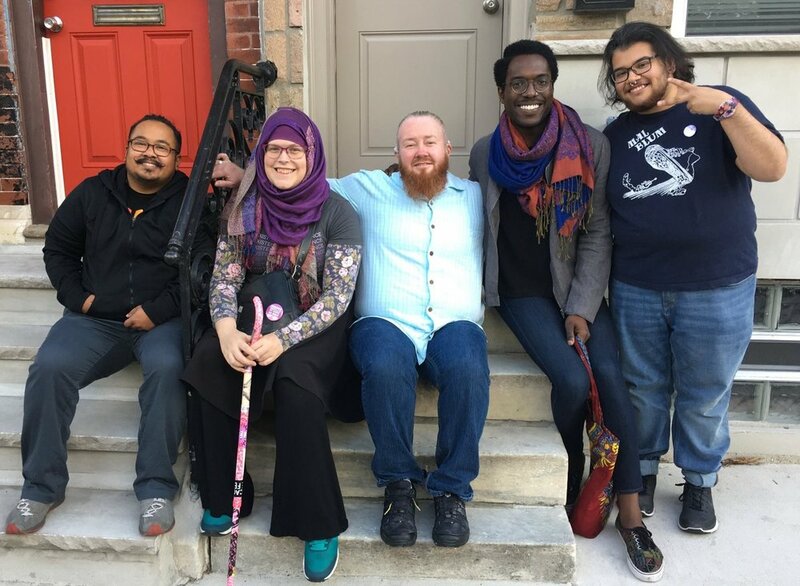 Our first official Muslim programming was led by Mr. Tynan Power, which eventually led to the Trans and Muslim Project launch in 2017. Programming includes Jumu'a/congregational prayer on Friday and daily prayer (Dohr and Asr). Transfaith executive director, Mx. Chris Paige, handed spirituality track leadership over to a variety of Transfaith volunteers who coordinated programming, while Transfaith staff focused on Transfaith organizational development. Transfaith takes the helm organizing spirituality track at the conference in full as an organization (not just as individual volunteers). Launch of the Contemplation Room, which is open every morning before the first workshops for those who want to use the space to set an intention for the day. It is also open for quiet, introspective time during all plenaries and lunch times, as an alternative space for those unsettled by crowds as well as others who seek to ground themselves during that time. First year for Non-Theistic workshops, honoring as a part of our programming the philosophical and energetic traditions, which may not recognize a divinity. Also a break through year for African Indigenous and Pagan offerings, as well as conversations about decolonization (though Pagan offerings have been present in some form since 2009). Transfaith returns with Roundtables for peer support, Being Brave Together faith stories, as well as “Transgender in the Bible Belt” and a multi-tradition sending service at the end of Saturday to help people prepare for the return trip. In addition to tradition-specific workshops and activities, you can expect a variety of multi-tradition opportunities to connect around particular themes.